Weather and water temperatures  provided by the U.S. Navy at Bayview. See current weather, winds and water temperatures as measured by the Navy at their weather buoy off Maiden Rock. Lake Pend Oreille Weather Cam  provided by the U.S. Navy at Bayview. See the current weather at the southern lake with this weather cam, updated every 10 minutes. 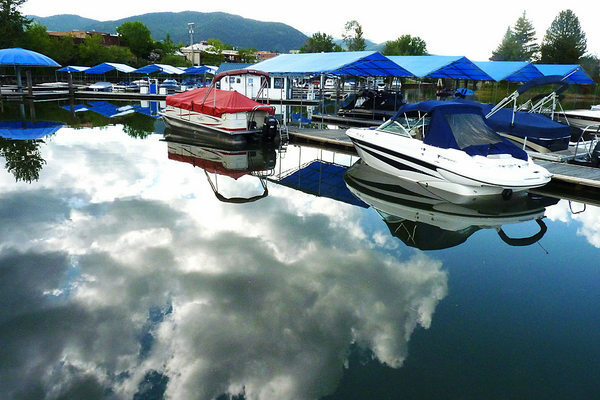 In Sandpoint, Sandpoint Marina in the Old Power House (208-263-3083) on Sand Creek offers marina services. Sandpoint Boat & RV Rentals operating at Sandpoint Marine & Motorsports, 195 N. Triangle Dr. in Ponderay, rents boats, houseboats and personal watercraft for use on Lake Pend Oreille and Priest Lake, as well as RVs (208-263-1535). Lake Pend Oreille Cruises has an 18-foot jet boat for rent that is designed for up to eight passengers (208-255-5253). Finally, the Alpine Shop, 213 Church Street (208-263-5157) offers small watercraft sales. Action Water Sports, owned and operated buy elite athletes and Sandpoint natives Nate Holland (two-time Olympian, six-time X Games gold medalist) and Pat Holland (World Cup medalist) offer lessons in all water sports and a full line of rentals including boats, jet skis, kayaks and stand-pp paddleboards. Click to their website or swing by their Sandpoint location at 100 N. First Ave., behind Starbucks on the Sand Creek boardwalk; or call 208-255-7100. Now serving Hope at their new location at the Floating Restaurant with a full line of rentals; call 208-255-6761. Sandpoint Watersports offers ski and pontoon boats available at reasonable prices, with 24-hour reservations possible online or by calling 208-920-9292. Located at Dover Bay Resort next to boat launch and marina. Boats are also available for long-term rentals - and ask about the Dover Bay Resort discount. Water Craft Rentals, located at 63 McGhee Rd. #107, 208-265-9672, offers most all boats used on Pend Oreille Lake. Power Boats, Kayak Rentals, Fishing Boats, and much more. Seasonal moorage is available through the City of Sandpoint at City Beach Marina and The Windbag Marina, also at City Beach. The city also accepts reservations for visitor moorage. (208-263-3613). Day use moorage is available at City Beach on the east side of the boat launch or at the boardwalk along Sand Creek (not accessible to sailboats). Nearby in Sagle, the Bottle Bay Resort & Marina has rentals including a ski boat, pontoon boat, wakeboard boat, deckboat, fishing boat, a SeaDoo, kayaks and paddleboards available through A Day On the Lake Rentals (208-755-4958 or 208-661-1870). A Day On the Lake Boat Rentals also opens a second summertime location at Willow Bay Marina, 9 miles west of Highway 95 on Dufort Road in Sagle, with ski and pontoon boats, along with paddleboards and kayaks (208-755-4958 or 208-661-1870). In Dover, the Dover Bay Marina offers moorage, canoe and kayak rentals, and other services. In Hope, Hope Marine Services offers rentals of various power craft (208-264-5105) and also boat sales and service. BC&M Houseboat Vacations rents houseboats for sightseeing, fishing or family vacations on Lake Pend Oreille at Hope. (208-255-5750). Holiday Shores/East Hope Marina (208-264-5515) offers moorage and numerous services, including fuel and pumping-out station. In Bayview, MacDonald's Hudson Bay Resort (208-683-2211) on the south side of the bay in Bayview rents a 20-foot sailboat, 15-foot fishing boats and canoes. For more information, go to the Super Directory and see Marinas & Boating Services. One of the most elegant chartering power vessels for small to medium-size groups on the lake is the Shawnodese, a classically styled ferryboat captained by Curtis Pearson. Check out the Lake Pend Oreille Cruises home page, or call 208-255-5253. If you're more interested in experiencing the lake in the intimacy of a paddle boat, Full Spectrum Tours (208-263-5975) offers scenic lake tours by kayak on both Lake Pend Oreille and Priest Lake, specializing in smaller groups, and also offers kayak rentals. For more information, go to the Super Directory and see Tour Guides & Outfitters.